Our next radio show will be broadcast between 8pm and 10:30pm(ish) GMT on 29th September 2015 – on Dapper FM. It will be a ‘We Shall Overcome’ Special. 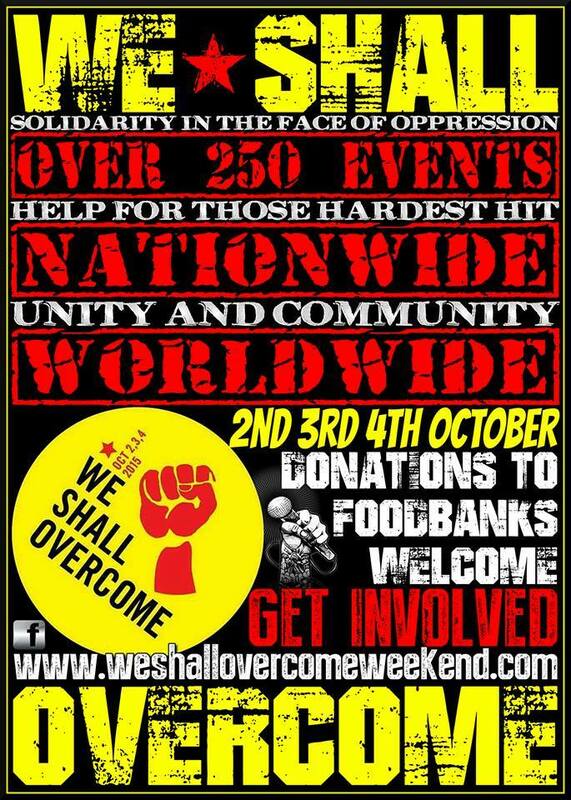 The We Shall Overcome Weekend, takes place over the weekend of 2nd 3rd and 4th of October 2015. There will be cultural events happening all over the UK to both to simply celebrate our culture and to shout from the roof tops that we are opposed to austerity. Never ones to miss out on a rebellious knees up, Peppermint Iguana Radio will be showcasing some of the bands playing up and down the country on our next show on 29th September. Thrown into the mix we will also have some of the bands that play the Something Else in the Dean Festival 25/26/27 September, a splattering of the best new releases from recent weeks and we will be digging out some Bosnian grooves (if we can find any) to get us in the mood for our trip to Sarajevo to cheer on the mighty Wales footyball team. All broadcast radio stntaois require a license from the Federal Communications Commission, and there are LOTS of forms to fill out. You can learn more about professional radio stntaois at the Web site of Radio World magazine, listed below.There are two other things you can do. The first is to get a job or internship at a radio station so that you learn about the business and operation of radio. The second would be to start your own Web-based radio station, streaming the kind of programming that you want to broadcast. That way, anyone in the world can listen to your programming and you don’t need an FCC license. You will eventually have to pay fees to ASCAP and BMI for the music rights, however.Your library might have books on radio station operations. Ask a librarian for assistance.Good luck! How does one go about starting their own radio saoittn? Are there laws or restrictions or some kind of form I should know about or fill out? Does anyone know any websites or reliable sources of information that can accurately answer these questions? The radio saoittn would be small, of course, and would play a variety of music, have a few talk shows, and it would be (at first) voluntary, until enough money can be raised to pay people. Local bands and businesses could adverstise as well. Main target: teenagers, high schoolers, recent high school graduates.If anyone can help me, I would really appreciate it!